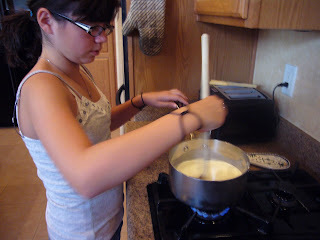 Cooking With The Kids: Sabrina's Making Ice Cream! Since the temperatures are well over 100 degrees - and they won't be going down anytime soon (like October! 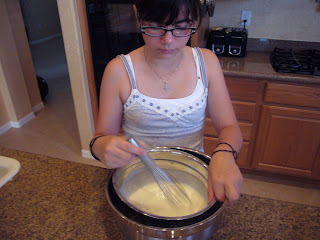 ), Sabrina decided it was time to break out the ice cream maker! She received this as a gift last year for her birthday, but we have had trouble finding a recipe that produced good quality ice cream. So far, all the recipes we've tried are too icy. Now, the machine she is using is supposed to produce soft serve, but we are looking for a recipe that stays reasonably soft after it's been in the freezer for several hours - without being too hard. First, Sabrina prepared the ice bath. 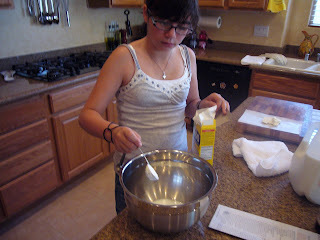 Then, she mixed milk and cornstarch. We've never put that into ice cream before! She measured out the cream cheese and set it aside to soften. According to the recipe, you add the cream cheese to keep the ice cream "scoopable". Then she combined the milk, cream, sugar and corn syrup. She brought it to a boil, then whisked it into the cornstarch mixture. Return the entire mixture to the pan and return it to a boil, stirring constantly until it boils and thickens. 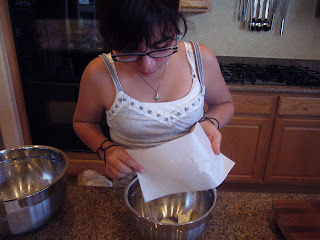 Carefully whisk the hot mixture into the cream cheese and whisk until completely blended. 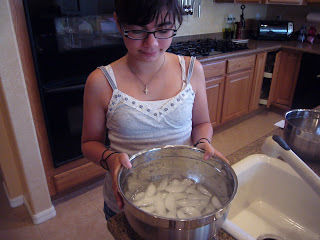 Put the mixture into the ice bath and stir occasionally until it is cold, about 20 minutes. Pour the cold base into the ice cream maker and let it go!! It took about 20 minutes for our machine to produce the ice cream. The verdict? WOW!! 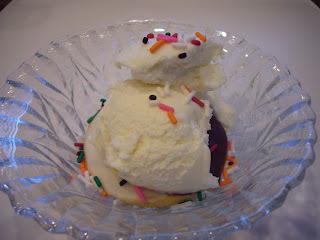 Alexander had a black and white cookie on the bottom, two scoops of ice cream, and topped it with rainbow sprinkles. Update: Even after freezing for several hours, the ice cream was smooth, creamy and easy to scoop. Strain the ice cream base into an ice cream maker and freeze according to the manufacturer’s instructions. Pack the ice cream into a plastic container. Press a sheet of plastic wrap directly onto the surface of the ice cream and close with an airtight lid. Freeze the vanilla ice cream until firm, about 4 hours. Oh yum! this looks delicious! Nice and creamy!! Great job! I love all of the stuff that you make in the kitchen!